Serve your parrot a complete daily nutrition in tune with your bird's well-being. Delicious and irresistible natural pellet diet appeals to birds without artificial colors, flavors or preservatives. Guaranteed percentages of added vitamin and minerals PLUS encapsulated digestive probiotics help ensure companion birds receive the nutrients necessary for good health. 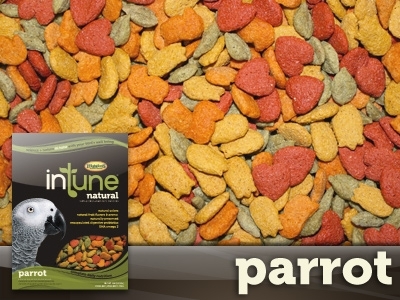 My parrot loves this food and every time I order it I can tell by the color that it is fresh. My last order of this food did not come in that way and it was disappointing but since it is only one time out of the numerous times I ordered it I'll overlook it. Ingredients: Ground yellow corn, Brown rice, Soybean meal, Ground wheat, Oatmeal, Cane sugar, Canola Oil (preserved with mixed Tocopherols ? a source of Vitamin E), Dicalcium phosphate, Dried egg product, Flaxseed, Calcium carbonate, Alfalfa nutrient concentrate, Sea salt, Cranberries, Apples, Blueberries, Celery, Beets, Parsley, Lettuce, Spinach, Watercress, Brewer?s dried yeast, DL-Methionine, L-lysine, Choline chloride, Algae meal, Mixed Tocopherols (a natural preservative), Rosemary Extract, Potassium chloride, Yeast extract, Iron oxide, L-Carnitine, Vitamin A supplement, Vitamin D3 supplement, Vitamin E supplement, L-Ascorbyl 2-polyphosphate (source of Vitamin C activity), Zinc sulfate, Ferrous sulfate, Niacin, Folic acid, Biotin, Manganese sulfate, Copper sulfate, Calcium pantothenate, Thiamine mononitrate, Pyridoxine hydrochloride, Riboflavin supplement, Zinc proteinate, Manganese proteinate, Copper proteinate, Menadione sodium bisulfite complex (source of Vitamin K activity), Calcium iodate, Sodium selenite, Cobalt carbonate, Vitamin B12 supplement, Turmeric, Natural annatto coloring, Beet Juice, Natural citrus Flavor, Natural banana Flavor, Natural Pineapple Flavor, dried Enterococcus faecium fermentation product, dried Lactobacillus acidophilus fermentation product, dried Lactobacillus casei fermentation product.